Long before now, you'll agree with me that, before you can be able to watch a video sent to you by friends on Whatsapp, you will have to tap on download icon to download the video before you can play it. 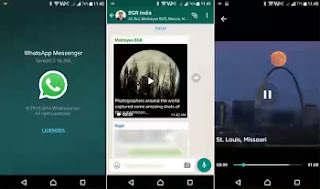 But now, the uplifting news is that, Whatsapp is working on a version that allows you to stream a video that is being sent to you before downloading it. As you can see buffer on videos you watch online, that's how it is on Whatsapp. You'll see a play button instead of the normal download button when you received a video on Whatsapp. When you tap the button, the video will start buffering, and you will be able to watch the video while it is being downloaded on your phone. This feature is already available on WhatsApp beta version 2.16.365. If you are already a Beta tester of Whatsapp, you can head over to Google playstore for the Beta update. The normal Whatsapp update for this feature will be officially released on the Google Playstore soon or later. For now, there's no working MTN cheat. What exactly do you mean by MTN browsing? It should. What internet sign are you seeing?